This article is a short summary of Super Mario Odyssey. 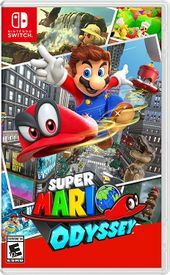 Super Mario Odyssey is a 3D platforming game and the sixteenth entry in the core Super Mario series. The game was released in October 2017 for the Nintendo Switch. Mario's on a Globe-Trotting Adventure! Control enemies with a toss of your hat! Share Joy-Con to help Mario out. The game begins with a battle between Mario and Bowser on an airship in flight. Using his hat, Bowser is able to easily defeat Mario and send him flying off the airship, then takes off to prepare for his wedding with Peach. Mario lands in the Cap Kingdom, where he meets a ghostly hat-like character named Cappy, who explains that Bowser had previously invaded the Cap Kingdom and kidnapped his sister Tiara. After defeating one of the Broodals, minions of Bowser helping to plan his wedding, in the Cap Kingdom and recovering an airship named the Odyssey, Mario and Cappy set off on a journey to stop Bowser's wedding. Super Mario 3D World returns to the "sandbox" style gameplay of Super Mario 64 and Super Mario Sunshine, in which Mario traverses large open-ended areas to find Power Moons. The game features Mario traveling to different locations across a new world by airship. Mario gains a new ally known as Cappy, who dwells inside of his hat. With Cappy, Mario can throw his hat to attack enemies, and can also "capture" certain enemies and objects, possessing them and allowing him to use abilities specific to the captured target. Super Mario Odyssey also features a two-player co-op mode that allows a second player to control Cappy. According to Shigeru Miyamoto, the decision to use the original 3D gameplay style for Super Mario Odyssey was out of a desire to create Mario a game for the "core" audience on the Nintendo Switch, as games like Super Mario Maker and Super Mario Run were already developed for more casual players. Within one month after the Nintendo Switch Presentation 2017, the first Super Mario Odyssey trailer became the most-viewed gameplay trailer on Nintendo's YouTube channel, with over 11.2 million views. Famitsu rated Super Mario Odyssey an overall near-perfect score of 39/40 (10/10/9/10). 1.0.1 October 27, 2017 Game fixes. 1.1.0 November 30, 2017 Adds support for Korean language. 1.2.0 February 21, 2018 Adds the Balloon World minigame, adds new outfits, adds new filters for Snapshot Mode, adjustments to the Jump-Rope Challenge minigame, resets World Rankings and Friend Rankings for Jump-Rope Challenge, gameplay fixes. ↑ 1.0 1.1 Super Mario Odyssey - Game Trailer - Nintendo E3 2017. Nintendo (YouTube; June 13, 2017). Retrieved July 27, 2017. ↑ Switch and Play 게임 생활을 보다 액티브하게! 한국닌텐도, 「Nintendo Switch™」 12월 1일 국내 정식 발매 결정. Nintendo of Korea (September 20, 2017). Retrieved September 20, 2017. ↑ 3.0 3.1 3.2 Nintendo Switch Presentation 2017. Nintendo (YouTube; January 12, 2017). Retrieved January 13, 2017. ↑ Super Mario Odyssey - Co-Op Demonstration - Nintendo E3 2017 . Nintendo (YouTube; June 15, 2017). Retrieved July 27, 2017. ↑ Miyamoto on Super Mario Odyssey - Nintendo Treehouse Live with Nintendo Switch. NinEverything (January 13, 2017). Retrieved February 15, 2017. ↑ 6.0 6.1 Famitsu Review Scores: Issue 1507. Gematsu (October 17, 2017). Retrieved October 18, 2017. ↑ Super Mario Odyssey becomes Nintendo's most-viewed game trailer ever. Destructoid (February 3, 2017). Retrieved February 15, 2017. ↑ Super Mario Odyssey - version 1.0.1 update available. GoNintendo (October 27, 2017). Retrieved October 27, 2017. This page was last edited on 22 February 2018, at 21:31.